Not being Elon Musk or Ray Kurzweil, I still have the chance to give public talks from time to time. I recently came back from my vacation in Japan where I managed to, in addition to relaxing, give three talks at different universities (two at Nagoya U and one at Tohoku U), and one at Toyota Central Research Lab. My talks mostly focused on Analytics and IoT, and their practical applications. On August 29th, at 6:30 pm, in San Francisco, I will deliver a Keynote talk at the ASME’s Information Storage and Processing Systems Conference. The title/topic for my talk will be the following: A Short Introduction to Big Data Analytics, the Internet of Things, and Their Synergies. If you have time and interest, feel free to stop by. Either way, wish me luck :). 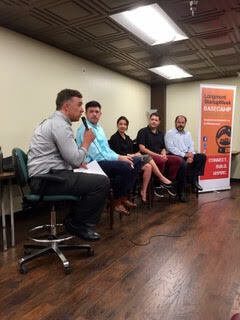 On July 28, I will take part in a discussion panel during Longmont Startup Week. This entry was posted in Amazing technology, data, and people, Analytics, data analytics, big data, big data analytics, data on the internet, data analytics meaning, Data Analysis and Visualization, IoT, Internet of things, smart connected devices, IoT analytics, Random, Startups, The future of artificial intelligence and tagged conference presentation, public speaking. Bookmark the permalink.